failure, after primary open or laparoscopic antireflux surgery. To prevent hiatal hernia recurrence some authors recommend the use of prosthetic meshes for reinforcement of the hiatal crura. The aim of the present retrospective study was to evaluate primary sutured closure and onlay mesh prosthesis applied during laparoscopic refundoplication after primary failed antireflux surgery. 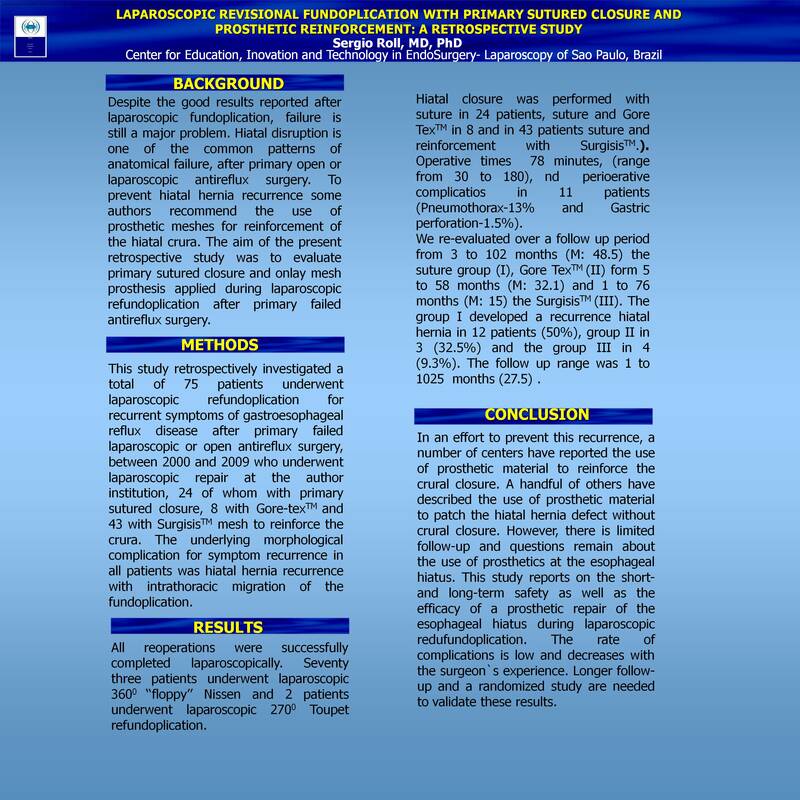 Methods: This study retrospectively investigated a total of 75 patients underwent laparoscopic refundoplication for recurrent symptoms of gastroesophageal reflux disease after primary failed laparoscopic or open antireflux surgery, between 2000 and 2009 who underwent laparoscopic repair at the author institution, 24 of whom with primary sutured closure, 8 with Gore-texTM and 43 with SurgisisTM mesh to reinforce the crura. The underlying morphological complication for symptom recurrence in all patients was hiatal hernia recurrence with intrathoracic migration of the fundoplication. Results All reoperations were successfully completed laparoscopically. Seventy three patients underwent laparoscopic 3600 ‘‘floppy’’ Nissen and 2 patients underwent laparoscopic 2700 Toupet refundoplication. Hiatal closure was performed with suture in 24 patients, suture and Gore TexTM in 8 and in 43 patients suture and reinforcement with SurgisisTM. Operative times 78 minutes, (range from 30 to 180), nd perioerative complicatios in 11 patients (Pneumothorax-13% and Gastric perforation-1.5%). Conclusions In an effort to prevent this recurrence, a number of centers have reported the use of prosthetic material to reinforce the crural closure. A handful of others have described the use of prosthetic material to patch the hiatal hernia defect without crural closure. However, there is limited follow-up and questions remain about the use of prosthetics at the esophageal hiatus. This study reports on the short- and long-term safety as well as the efficacy of a prosthetic repair of the esophageal hiatus during laparoscopic redufundoplication. The rate of complications is low and decreases with the surgeon`s experience. Longer follow-up and a randomized study are needed to validate these results.